Meanwhile prepare the Chicken Filling: Heat the oil and butter in a large skillet over medium high heat. Add the onions, celery, carrots, and mushrooms and saute until the onions are translucent and the carrots and celery are tender crisp. Season with about 1/4 - 1/2 teaspoon (1-2 grams) of salt and 1/2 teaspoon (2 grams) of black pepper. Add the wine and simmer rapidly until the wine has evaporated. Then add the flour and stir over medium heat for about two minutes making sure all the vegetables are coated with the flour. Gradually add the chicken broth and stir until smooth. Let simmer for about five minutes. Stir in the tarragon and thyme. Then gradually add the cream stirring to combine. Stir in the frozen peas and chicken. Simmer until the peas are cooked. Taste and add more salt and pepper if needed. Finally, stir in the chopped parsley. Divide the filling equally among your pie pans. Let cool to room temperature while you roll out your pastry. Preheat your oven to 375 degrees F (190 degrees C). When chilled, remove the pastry from your refrigerator, and divide into 4 - 5 equal pieces (depending on the size of the pie pans you're using). On a lightly floured surface, roll out each round of pastry to cover your pans. To prevent the pastry from sticking to the counter and to ensure uniform thickness, keep lifting up and turning the pastry a quarter turn as you roll (always roll from the center outwards). When the pastry is rolled to the desired size, cut three slits in the center of the pastry so the steam can escape during baking. Gently place the pastry over the chicken filling. Lightly press the pastry around the edges of the pan to seal and then press the edges of the pastry with the tines of a fork. Brush the tops of the pastry with an egg wash (whisk one large egg with 1 tablespoon cream) and sprinkle with some grated parmesan cheese, if desired. Place your Chicken Pot Pies on a large baking sheet and bake for about 30-35 minutes or until the pastry is golden brown and the juices are bubbling. Let cool about 10 - 15 minutes before serving. The Chicken Pot Pies can be frozen. Freeze uncovered and then put in an airtight container and return to freezer. Can be frozen for a couple of months. 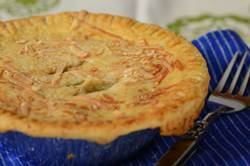 Makes five - 5 inch (12.5 cm) or four - 6 inch (15 cm) Chicken Pot Pies. Note: You can make one large Chicken Pot Pie. Use either a 9 or 10 inch (23 - 25 cm) deep dish pie plate.